I met him at a Minor League game at Bright House Field in Clearwater, Florida in 2014, when the Tampa Yankees, whom he was managing, came to play the Clearwater Threshers. It had been 14 years since the last time I got an autograph (Rich Monteleone) at a Minor League game. Ironically, it was these same 2 teams that I saw play, though, the Clearwater Phillies have since become the Clearwater Threshers and they left Jack Russell Memorial Stadium at the conclusion of the 2003 season. 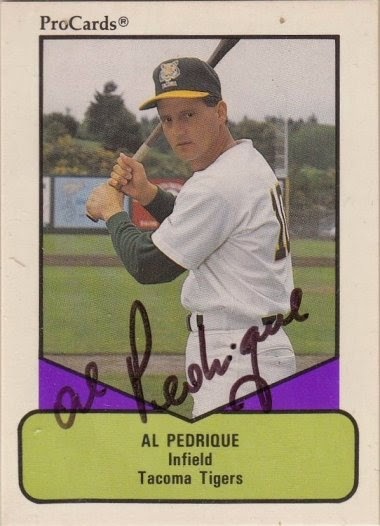 Al signed a 1990 ProCards card #149.